Pack your ski pants and your party pants for Cypress Mountain’s Slush Cup this weekend to mark the end of ski season. Cypress Mountain is partnering up with Red Bull to put on a party on Sunday, April 14 from 12 to 3 pm at the annual Slush Cup on Cypress Mountain. 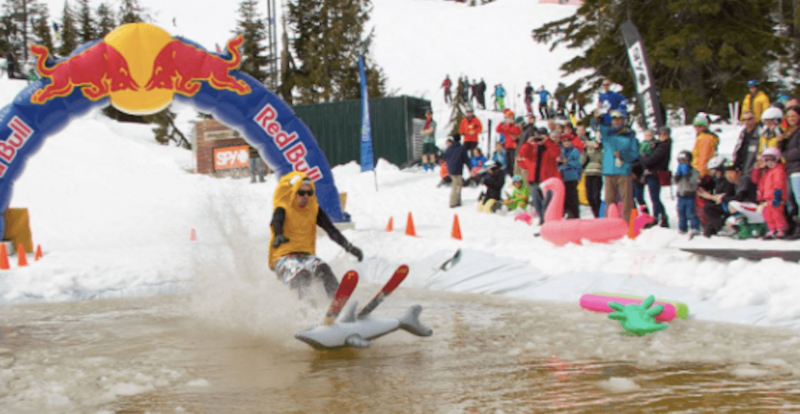 The object of the Slush Cup is to make it across a pool of water, on your skis or board, without falling in, while decked out in your costume. Whether you participate in their annual pond skimming challenge or watch from the sidelines in your crazy costume for their annual costume contest, you are guaranteed to be treated to a fun celebration. This year, guests are invited to wear throwback gear to celebrate their Retro final day of season, but all other costumes are still welcome. After your rip across the pond there will be a BBQ on the patio, with a live DJ, beers, free red bull, slushies, and a fire pit to help you warm up.